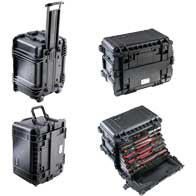 Over a two year period of intensive design, research and testing, Pelican™ Products built the world’s toughest mobile tool chest for use by the U.S. Armed Services. Over 70 tests were required, including water submersion, extreme temperature tests and drop tests from five feet fully loaded. The Pelican™ 0450 Mobile Tool Chest passed all of them. 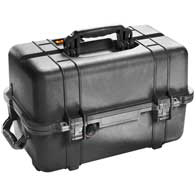 The Pelican™ 1460TOOL Mobile Tool Chest features a lid that opens up to 180° for on-the-field anti-roll stability, and adjustable and removable tray dividers for easy customization.